From overflow storage, to repackaging and logistics consulting, Brooks Distribution has cost-effective services tailored to fit your needs. We also offer a package of flexible billing options, including month-to-month and long term. 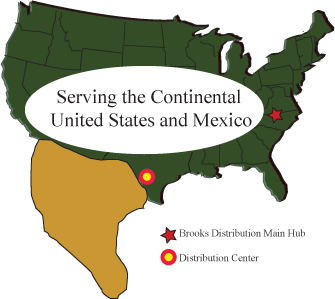 Brooks Distribution Services handles customized solutions including processing recalls, repackaging and product fulfillment. Our Advance Technology ensures careful and accurate inventory management of your products. Brooks offers full EDI functionality, bar coding and radio-frequency (RF) capabilities. Brooks offers language capabilities in English and Spanish to better serve all of our clients. Located in Mebane, North Carolina, Superior Logistics and Brooks Distribution team together to deliver you fast and efficient storage and shipping solutions reaching and exceeding expectations. Our customized warehousing and freight services allow us to maximize our value to each individual client, regardless of size. We have the drive and dedication to be recognized as an industry leader, and work hard with every client to achieve this level of recognition. Cross Docking Services along with re-deliveries within 5 miles of the Walmart Distribution Center in Mebane, North Carolina.